It’s less than seven weeks since Adam Fisher arrived at Hertford Town, replacing Gavin Kelsey at the helm. In the intervening period he’s had to build almost an entire new squad- but today it was announced that he had left the club by mutual consent. Town have played seven matches under Fisher’s leadership, picking up just one point as the former Welwyn Garden City boss has failed to turn the tide. 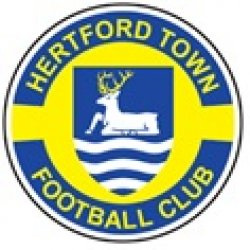 Hertford sit only three points clear of a relegation slot, and entertain third place Marlow on Saturday desperate for victory. Fisher has signed- by our quick calculations- twenty two players during his time at Hertingfordbury Park, although to give him credit he had little choice as the majority of Kelsey’s squad left the club after his departure. ‘It is with deep regret that by mutual consent I have left my role at Hertford Town with immediate effect. I would like to thank all the players and supporters for their effort in what has been a very difficult time for the club and wish you all the best for the future. We’ll bring you news of Fisher’s replacement when it is forthcoming.